Political Correspondent with the Sunday Business Post (Ireland). These are my (personal) thoughts on life and the news. We may have been shocked by the revelations of the Iraq and Afghanistan War Logs and the brutality of war that was laid before us in a way we’ve never seen before. But the initial revelations of Wikileaks release of US diplomatic cables are not as shocking as many in the media are having us believe. Embarrassing for sure but not shocking. 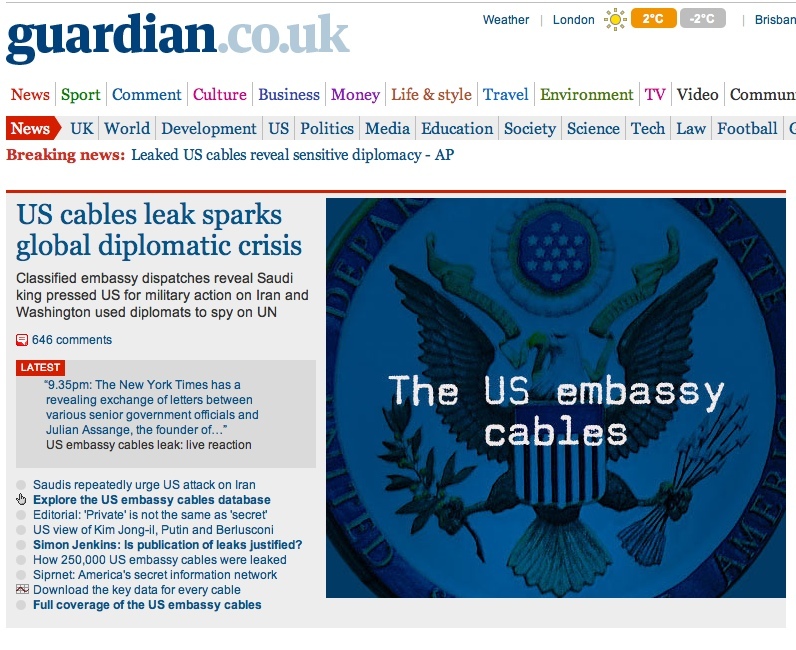 Channeled through those doyens of investigative journalism The Guardian, Der Spiegel and the New York Times the leaks reveal a lot of honest and forthright views of mainly US diplomats about their foreign counterparts. But looking at the BBC’s useful breakdown of the main “revelations” there’s nothing truly groundbreaking. Instead much of the releases so far confirm what any of us who have an interest in international affairs probably already expected was going on. The US has many concerns about Pakistan’s nuclear activity and the level to which they may be exposed to nuclear terrorism. Whilst on the other side Pakistan is reluctant to allow the US to establish any more interest in their domestic affairs than it already holds for fear of a backlash from their own people. This has been widely reported for many years. The Chinese government engages in computer hacking…as if we haven’t heard that before. The US looks to tap the sensitive biometric details of those within the UN. Not specifically something reported before but allies spying on allies and involving the Americans is nothing new. There are also a selection of strong and honest views about various world leaders. Iranian President Mahmoud Ahmadinejad described as “Hitler” by one diplomat. Given Ahmadinejad’s views on Judaism it is hardly an extraordinary leap to associate the two. Italian president Silvio Berlusconi described as a “feckless, vain, and ineffective as a modern European leader”. As if we didn’t know that already given the string of embarrassing revelations in recent years. Russian president Dmirty Medvedev a “Robin” to Vladimir Putin’s “Batman”. Many analysts said as much when Medvedev was “elected” in 2008. And Robert Mugabe, the president of Zimbabwe, a “crazy old man”. It would be funny if it wasn’t for the plight of the Zimbabwean people. But needless to say it’s embarrassing for the US and all the other countries implicated. And the news coverage over the next few days will remind us of that as well as discussing the wrongs and rights of Wikileaks releasing such material. Simon Jenkins in The Guardian puts that argument to bed in my view. Perhaps the real story here is not the sheer quantity and seriousness of some of the information released but the extraordinary story of a 22-year-old US army private from Oklahoma, Bradley Manning, who has changed forever the way in which wars and diplomatic relations are conducted. I had rather hoped that I would be updating this blog more regularly but alas this has not been the case so I apologise to my many readers (all five of them!) and promise only that I wil try to do better. It’s been pretty quiet of late. I’ve been getting the head down, trying to get on top of this dissertation although last night I got a welcome reprieve from an evening with the books when I was offered the chance to be part of Click Liverpool’s live coverage of Liverpool’s hosting of Birmingham, a game that disappointingly finished 2-2. It was my first foray into the press box at Anfield and indeed into the inner bowels of the stadium. The plush carpets and the warm and welcoming press room where soup, sandwiches, tea and coffee were aplenty. Unfortunately I’d been the chippy beforehand. As the journos were busy tapping away on their laptops and Mark Lawrenson was shooting the breeze with the BBC folk, joking about Andriy Voronin’s nickname being Bon Jovi I took it all in and learned a bit about how Click is covering each Liverpool home game with exclusive minute by minute reports. I was charged with the task of collating the stats as the game progressed, not as easy as you would think especially when temperatures felt like they were below zero and every so often I had to wiggle my toes just to ensure they weren’t frozen. Fortunately I had gloves for my hands, my colleague Richard Buxton wasn’t so lucky as he rubbed his hands together for heat whilst incessantly and impressively typing out the game’s action. In some ways the atmosphere was so much better in the press box as you could take it all in, the view was fantastic and you could hear Alex McLeish go mental on the touchline as well as witness at close hand Birmingham’s new owner, Carson Yeung, sit comfortably in his ridiculous dead animal coat. But then again there are draw backs like not being able to jump for joy when David Ngog opened the scoring or swear continually when Cameron Jerome put the visitors in front. Afterwards I took in the press conferences of McLeish and Rafael Benitez, both good football men, both disappointed. The former by David Ngog’s dive for the penalty and the latter by the result which makes it one win in nine games for the Reds. These are dark times at Anfield but yet there is a togetherness about the place and you can sense it just as much in the press room and the inner depths of the great stadium as you can in its famous stands. Following on from my blog yesterday I feel the need to inform as many people as possible of what happened on the day of Hillsborough, what happened subsequently and what continues to this day. Many people are still unaware of the enormous miscarriage of justice that took place in the aftermath and the conspiracy to cover up any wrongdoing by South Yorkshire Police. There are guilty people out there, living comfortable lives whilst families cannot grieve properly for their lost loved ones. Below is some stuff you should look at today, educate yourselves, become informed and join the fight for justice. It is a fight that has gone on these past 20 years without the intense media publicity of the last days and it will continue long after the media turn their attentions elsewhere. The club’s official TV channel is free to air all day and will have live coverage of the remembrance ceremony this afternoon. The club’s official website has some moving survivors’ stories and Lynne Fox’s moving picture story. The Liverpool Daily Post has a must read story about the families ongoing fight for justice which outlines the extent to which they were and continue to be let down by the establishment. David Conn’s brilliant piece in Monday’s Guardian outlines even further how much the families have been let down and includes an interview with the current chief constable of South Yorkshire Police. The BBC’s audio slideshow is not easy to watch but should be watched nonetheless. The website’s coverage features a wide range of video interviews with survivors, families, players, and more. If you think there’s anything else people should check out then leave a comment and link below. Finally I cannot stress enough the importance of watching Jimmy McGovern’s ‘Hillsborough’ docu-drama which is being re-screened on ITV 3 at 9pm tonight. If there’s one thing you watch on TV today it should be this. Educate yourself and then educate others. UPDATE: The Independent‘s James Lawton has also written a brilliant piece in today’s paper. We need more journalists exposing the sickening miscarriages of justice. TheJournal.ie Irish news, sports, business and entertainment website shaped by its community of users.